If Phyllis Dale hadn’t turned 75 and wanted us to perform Gumbo Bottoms for her birthday cruise, this revival would have remained just a wish we might have murmured in moments of reflection. Instead, with her command performance in mind, she set us into motion beginning with the production of a cast album with all the songs from the show. (Listen to and purchase the album here.) That accomplished, we began to discuss how to fit our current production into the Magnolia Lounge on board the Queen of the Mississippi Riverboat. With no stage, no lights, and low ceilings, we had our work cut out for us. 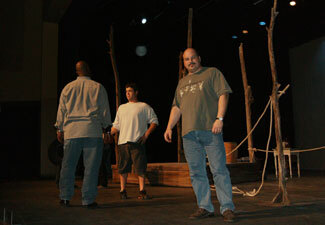 It meant Christopher Bolin would have to design a much smaller portable set and lighting rig. 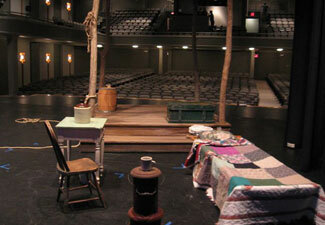 To make sure it would all work onboard the riverboat, we planned three performances in Turner Hall with the new set. It came off without a hitch and the show on the boat couldn’t have been better, unless we had been able to go along on the rest of the cruise. But being that there are 14 of us in the company, we walked on and walked off. Much easier said than done. 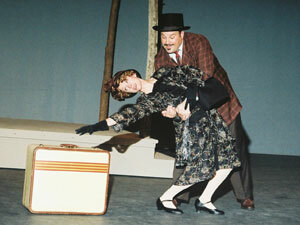 Try carrying a set and lights and sound equipment up and down a couple of gang planks. But we did and it will remain a high point in the history of this musical as we brought back the tradition of the “floating theatres” that used to dot the rivers during the steamboat days. 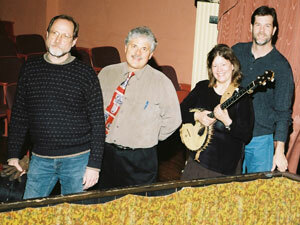 Our band: Dave Para, Kevin Hennessy, David Wilson and Cathy Barton. Back row: Willie Cogshell, Michael Crowe and Steve Jones. 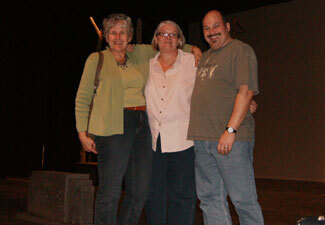 Willie Cogshell, Deb Jewett and Lesley Oswald try out the new set. 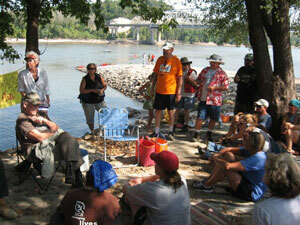 Gumbo Bottoms was just an idea in the summer of 2005 when Ludwig was collecting oral histories for Missouri River Communities Network. She met Fred Oerly, born in 1922, who could remember when his dad took him to the river to watch a house in the Overton Bottoms cave into the water. 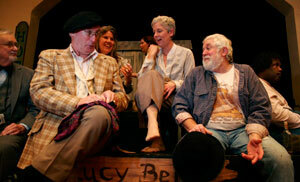 The script went through several readings before being put on its feet in a low budget workshop production at Turner Hall with Lesley Oswald as Vivian, Lou Thompson as Lucy, Damen Jones as Gabe, Tom Burns in the role of Jacques Jeanrue, Ed Scrivner as Gus and Tim Nadeau as the attorney. 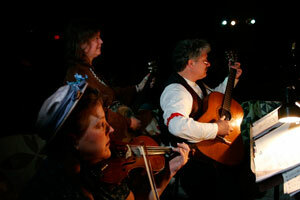 The band consisted of Cathy and Dave, Violet Vonder Haar on guitar and vocals, Sam Beide on bass and Amy Toomsen on fiddle. Watch the slideshow video of the November 2006 workshop production by Jeronimo Nisa here. “It got such a wonderful response,” said Barton. “And everybody kept asking, 'When are you going to do it again? '” Ludwig revised the script based on what she gleaned from the production. “It’s so important to see it on the stage before you share it with the world. You learn so much about the plot, the characters and from the feedback you get from your audience,” said Ludwig. Set in 1928, Gumbo Bottoms is the story of Vivian Marks, a wealthy easterner, who discovers her fortune has been squandered when her husband dies suddenly. 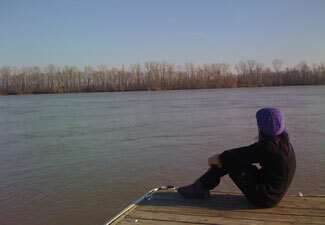 All she has left is a piece of bottomland in Missouri. “You mean “Misery”, Vivian sings in the opening song. Things go from bad to worse when she travels to Missouri only to discover her rich bottomland has been taken by the “Wiley Guiley Mighty Mo,” another of the 12 new songs by Ludwig and Barton. The story continues as big city wealth clashes with rural river life and basic survival crosses the racial divide. With song and dance, laughter and drama the 90 minute musical delivers a tribute to river life, rich, deep, inspired by stories from the region. The shantyboat docked at Launer Auditorium, Columbia College, Missouri, for two shows on Saturday, October 9, 2010 at 8:00 PM and Sunday, October 10 at 2:00 PM. We had one change in the cast. 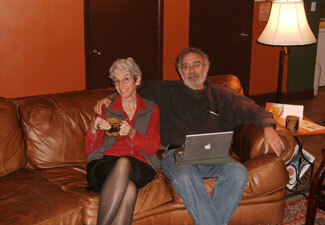 Amy Humphrey and Joe Hayes, also known as the band Clatter, were hard at work on a new CD. As they were busy writing and recording new music, Lesley Oswald, company director and choreographer, stepped back into the role of Vivian Marks. If you have been following the show since its workshop days, you will remember Lesley as Vivian before she took over as director for the premiere and subsequent tours. Joe Hayes was able to take time out to run the sound effects. 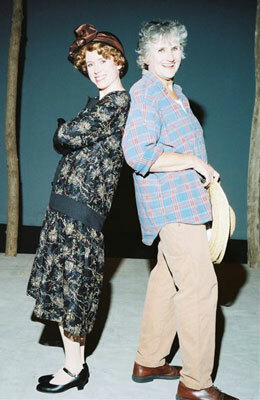 Amy shared many hours of her time, much enthusiasm and tremendous talent with the production and we miss her. This website is yet another of Amy’s contributions. Click here to read a review of Gumbo Bottoms. After our tour to Jefferson City, we took the rest of the summer off and then got ready for our one year anniversary celebration in the delightful river town of Washington, Missouri. Our sponsors were the Washington Area Chamber of Commerce and the Washington Historical Society. We did two shows at St. Francis Borgia Regional High School’s Theatre, a professional facility that any community should be proud to have. Our sponsoring organizations helped us celebrate one year on the road Saturday night after the show with a reception for host families and sponsors in the Missouri Photojournalism Hall of Fame, a beautiful historic building with a fascinating photography show. Sunday brunch was held at the Washington Historical Society Museum where we wandered through their wonderful displays. The Washington Turn Verein exhibit was of much interest to the River Rats as Turner Hall, their home base in Boonville, was once used by the organization and became the physical, cultural and social center of the community. We had time to enjoy restaurants, the coffee house, riverfront park, and the farmer's market. And with a nod to yesteryear, friends from Columbia decided to hop a train in Jefferson City and made the round trip in time for the Sunday matinee! 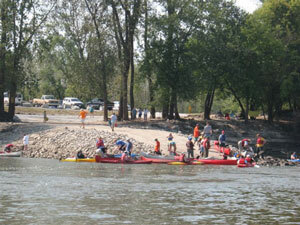 Be sure to check out our Washington review from the River Hills Traveler. Finding the nearest coffee shop in a new town is of utmost importance. 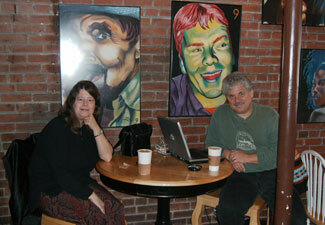 Mannwell’s Coffee Alley on Main Street was the perfect spot for the cast and crew to enjoy a cup. St. Francis Borgia’s Theatre is well loved by its students and well used with plenty of props around from past productions which kept cropping up in our production. 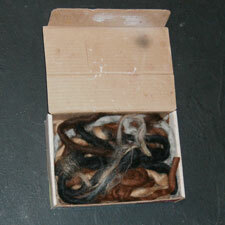 Like the hair in the pizza box! Back in July, the Jefferson City Community Concert Association brought us to the Miller Performing Arts Center for one show. 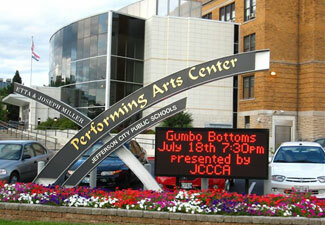 The Gumbo Bottoms Company reached new heights as we saw our name in lights for the first time. 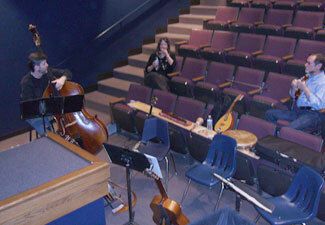 The Miller Performing Arts Center is a state-of-the-art facility including a backstage intercom system, spacious dressing rooms and a beautiful theatre. Vivian’s shantyboat home on the stage at Miller. Christopher Bolin’s set and lights, the cast, the band, the crew all brought a beautiful production to our capitol city. The audience had a terrific time, appreciating a musical that is so close to their own river culture. The show continues to grow and evolve as the company has more opportunities to perform. Members of the Gumbo cast and band kicked off the 2009 Brown Bag Concert Series on June 5, 2009. 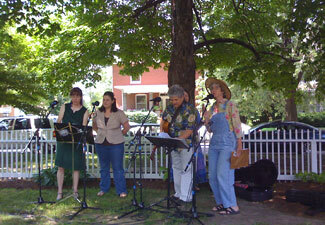 The large turnout enjoyed incomparable weather while listening to tunes from the show sung by Dave Para, Cathy Barton, Tanjie Hoover, and Amy Humphrey. 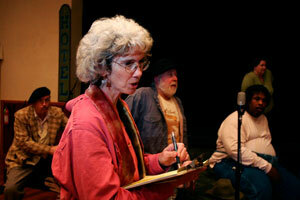 Meredith Ludwig provided story narration between songs. 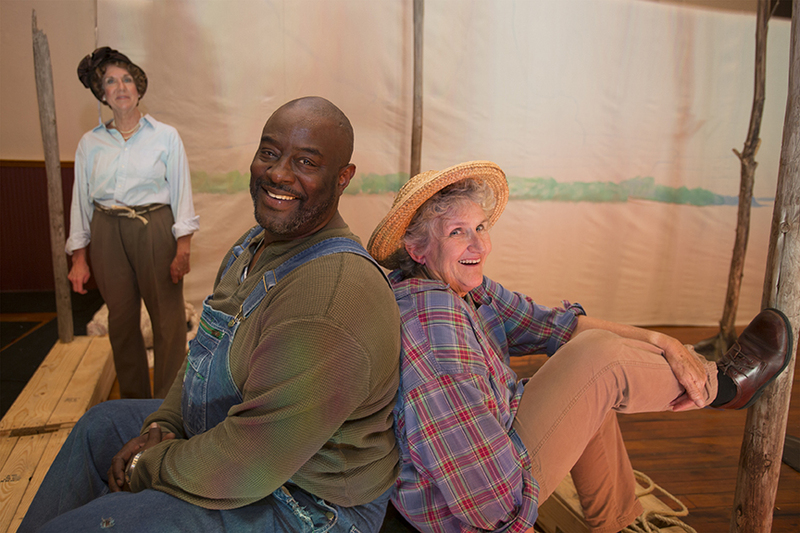 It was the unwavering enthusiasm of fellow River Rats, Marsha Nyberg and Gary Leabman, that brought the tour of Gumbo Bottoms, a Big Muddy Musical, down river to the historic Showboat Community Theatre in Hermann for three shows on Saturday, March 7 and Sunday, March 8. 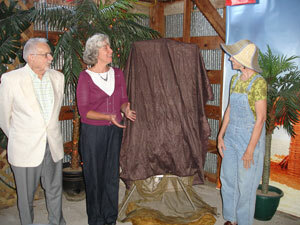 Marsha and Gary attended the workshop production in fall 2006 and since then have been determined to bring Gumbo Bottoms to Hermann where they now live and operate Spirit Hill Guest House. 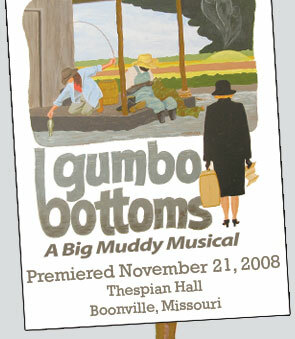 As patrons of the arts, their firm belief in this original “Made in Missouri” musical was instrumental in planting the idea that the show should go on the road. Marsha sent this note: Patrons left the theatre humming the tunes, tapping their toes, and enthusiastically sharing opinions about their favorite actors, scenes and songs. The consistently fine quality of the actors, voices, sets, lighting and production values is something our small theatre is not used to seeing. Audiences were thrilled with the production, and everyone from the mayor to prominent business people to multi-generation families is asking for "more like this!" 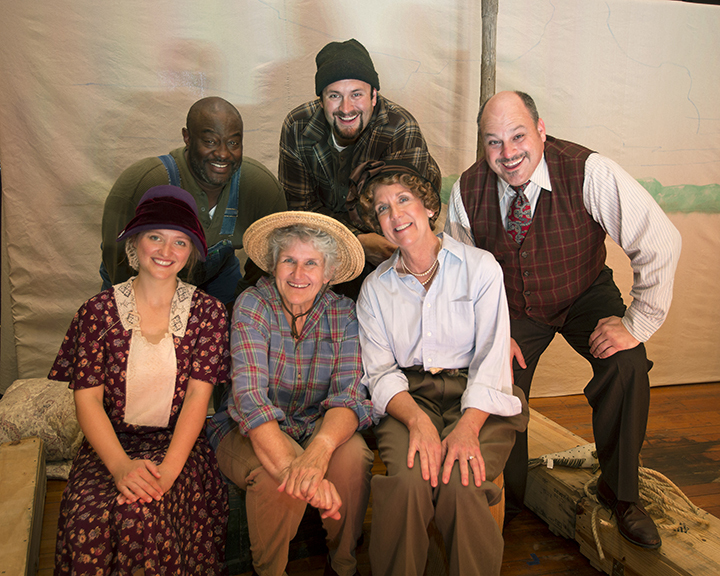 What a rewarding experience -- working together as a community to bring this one-of-a-kind production to town. 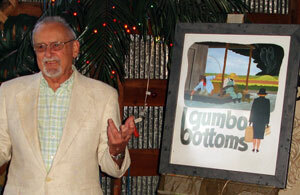 We're looking forward to "Gumbo Bottoms - The Sequel!" Also sponsoring the first stop on the tour were Hermann Arts Council, Hermann Tourism Commission, Hermann Area Chamber of Commerce and the Dierberg Foundation. The company cast members from the premiere, Amy Humphrey, Deb Jewett, Willie Cogshell, Steve Jones, Josh Kluck, and Tanjie Hoover and band members, Barton on banjo and Indian flute, Dave Para on guitar, Tom Verdot on fiddle, and Kevin Hennessey on bass, were all able to make the stop in Hermann and enjoy the charm of the town as well as the people. “As the behind-the-scenes "prop master", I loved bringing the ART of original Missouri theatre to a quaint little art deco theatre in the heart of Missouri. In another era, when people captured and reflected the nature of life in their times, they lived and breathed it into theatres such as the Showboat in Herman, MO. May these old theatres be born again!...as artists living in their midst rise once more to capture our human spirit and share it on stage with the actors, crews, musicians and audiences who all--on stage and off--are transformed for a few hours in the dancing light of the these deeply-shared reflections. 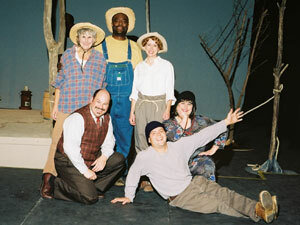 We put on several events to celebrate the premiere of Gumbo Bottoms and we had a visit with Paul Pepper. 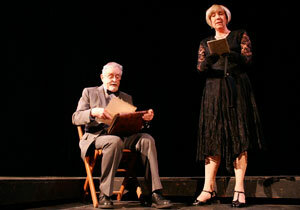 Click here then select "Performances" at right, then "Cathy and Dave." Tim Nadeau’s new painting commissioned for the world premiere of Gumbo Bottoms was sold by silent auction to the highest bidder, Dave Nicholas, Mayor of Boonville and owner of Country Mart Grocery Stores. 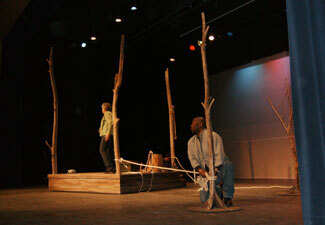 Used throughout this website and on posters and postcards to publicize the show, Nadeau’s work captured the central theme of the script which deals with the clash of big city and rural river cultures. The proceeds went towards the commission paid to the artist. 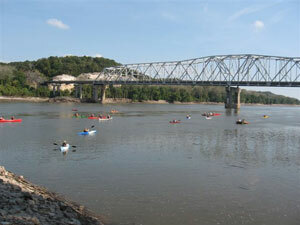 The River Float was a guided float trip on the Missouri River from Rocheport, MO to Katfish Katy's to kick off Gumbo Bottoms. Katfish Katy's provided free Blues Music & there was BBQ for sale. There was also a sneak preview of the musical at Katfish Katy's. Sponsored by Turner Hall River Rats for the Arts, MRCN, Mighty MO Canoe Rental, United States Canoe Association, and AmeriCorps Vista. Read more at the Columbia Missourian and Columbia Tribune. 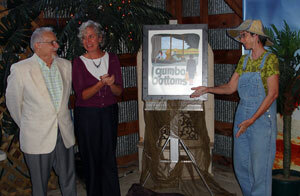 The unveiling of the original Gumbo Bottoms poster art by Tim Nadeau commissioned by the Turner Hall River Rats for the Arts. 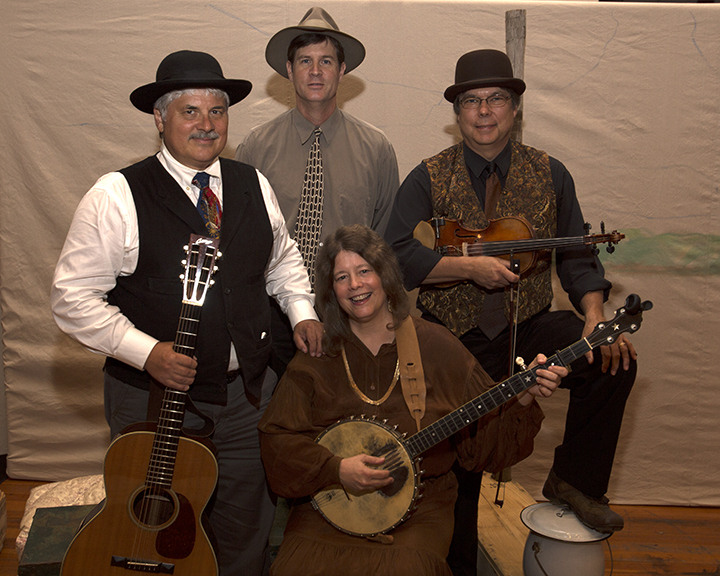 Boonville's own Bluegrass Roundup and Columbia's Curreykorn will perform Friday, September 26 to benefit the premier of Gumbo Bottoms, A Big Muddy Musical. 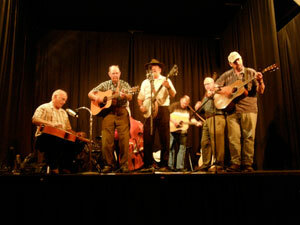 Donations will be accepted at the door of Turner Hall, 518 Vine Street, Boonville when the two bluegrass bands kick-off the benefit at 7:30 p.m.
Bluegrass Roundup is a home grown band. Members include Albert Smith, Lloyd Rhoton, Alan Voss, Phyllis and Ron Taylor and Don Case. 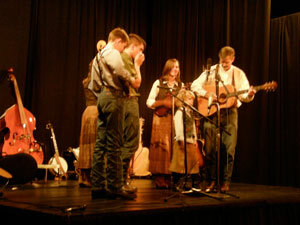 The group plays traditional bluegrass, old time fiddle tunes with a twist, gospel and some not so traditional songs. 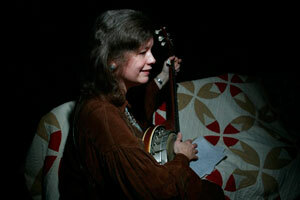 Bluegrass Roundup pushes their instrumentals into overdrive and combines their hard driving tempos with smooth harmony. 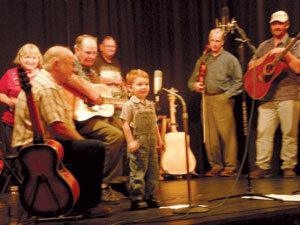 Curreykorn, a family band, offers a blend of bluegrass, gospel and old-time fiddle music. 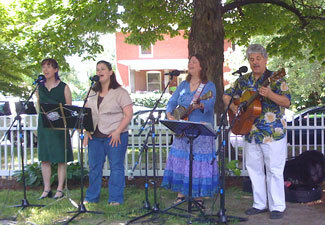 The band features David and Nancy Currey and their five children. 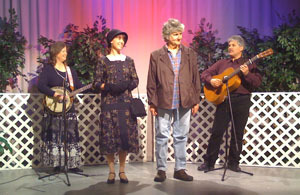 Audiences throughout mid-Missouri have been delighted by the upbeat musical experience combined with their good-natured wholesome sense of humor. 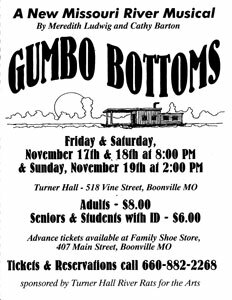 If your community is interested in bringing the production of Gumbo Bottoms to a theatre near you in 2009, please contact Turner Hall River Rats at 660-882-3300 or e-mail info@gumbobottomsmusical.com.